Our recently renovated ensuite is probably the most masculine, no-nonsense, toned-down space in our house. It’s completely monochromatic, which is something I don’t typically do a lot of in our home. There are however, some very cool design elements in this space that I wanted to be left alone to shine without adding colour to the mix. 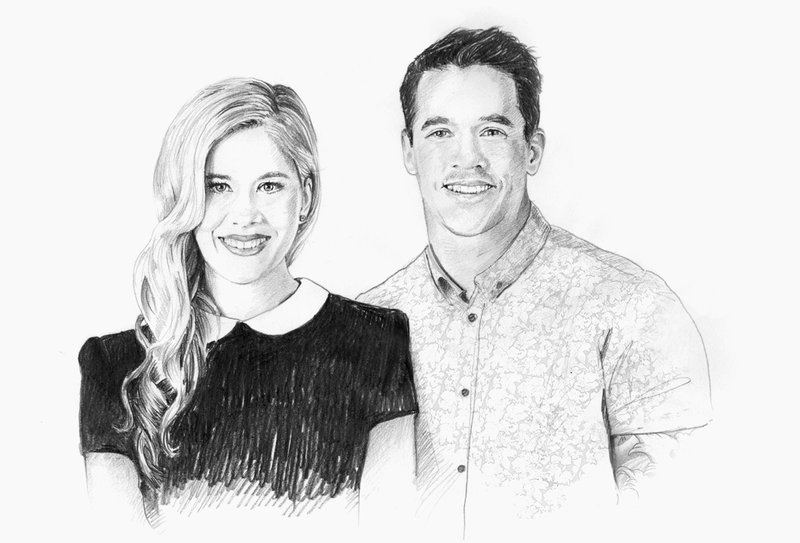 It leaves me the opportunity to accessorise whenever and however I want and in doing so, I can completely change the mood of the space on a whim. 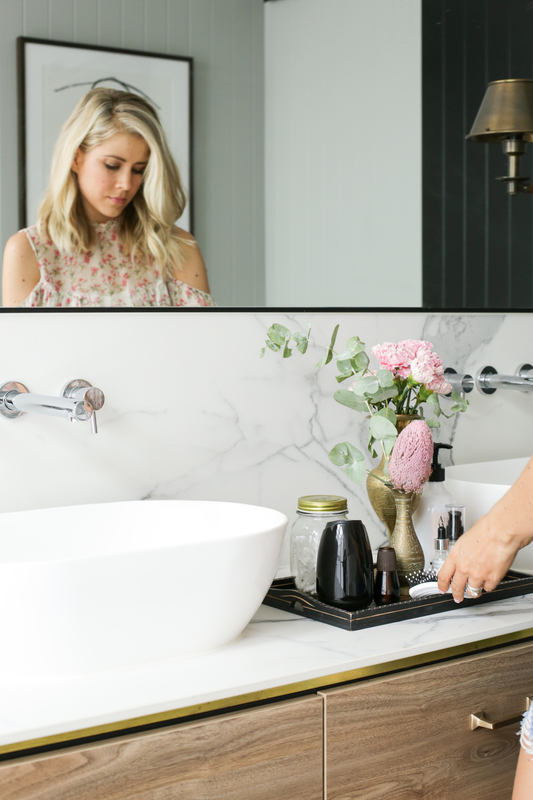 We’ve partnered with Air Wick Australia to show you how to create mood in your home using the new Essential Mist and where we used the Fresh Water Breeze scent in the hallway, the Peony and Jasmine scent is my inspiration to add a sense of femininity to the ensuite. I want to create a feeling of casual feminine confidence here and to achieve that, I’ve addressed colour, texture and scent. The elegance of the marble splashback, the fine black accents, the aged brass, and the refined organic shapes in the space provide the perfect backdrop for my ‘casual feminine confidence’ objective so I only had to add a few key elements to complete the look. The Air Wick Essential Mist diffuser is acting as my starting point in creating this particular vignette. What I like about it is that its dark colour and clean, organic lines make it easy to slip into any space. It doesn’t demand any attention as it subtly releases a floral fragranced mist, infused with essential oils. The combination of the scent and the addition of the complementary floral arrangements feel like a breath of fresh air. It’s also a major perk for someone like me that the diffuser is easy to operate (I’m no gadget girl). It’s battery operated, which means there’s no power point required and I can relocate it with ease. The vintage brass vases form part of a growing collection that I started a few years back. The aged patina adds soul to the modern choices and complement my other brass accents in the space. 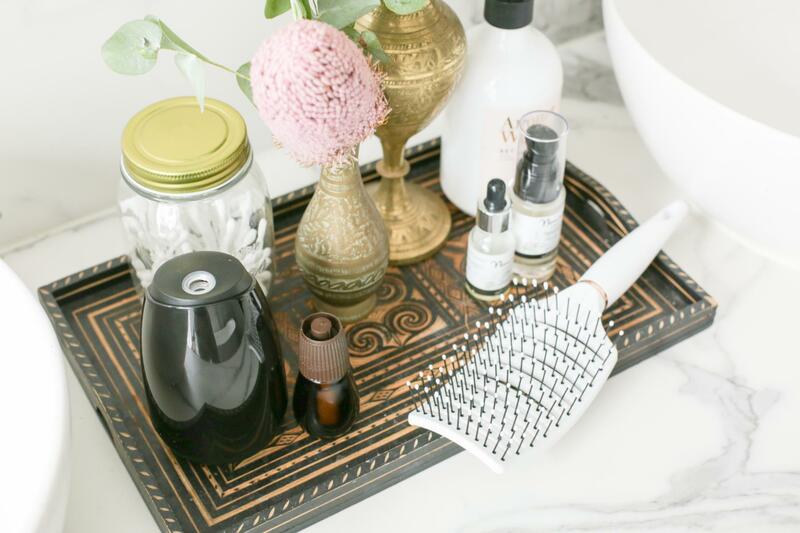 For the sake of keeping your space functional and neat, it’s a good idea to empty bathroom supplies, like cotton buds and cotton swabs from their packaging and store them in inexpensive, translucent jars. It both, looks neat and provides easy access. I’ve mimicked the floral fragrance of my Essential Mist with my flower choices. Including foliage, flowers or a plant is key to the success of any interior space and in this case I’ve worked in a combination of tactile, soft pink floral. Just a hint of this colour does the job in softening this space. 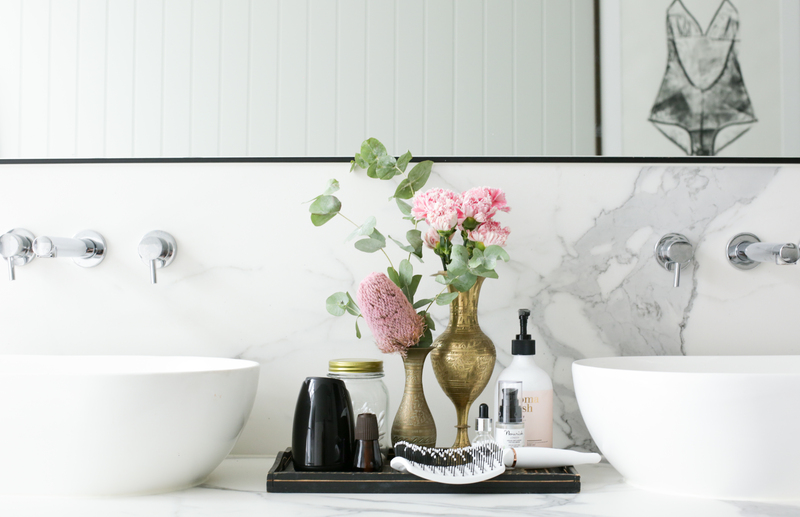 It’s the yin to the yang of the more masculine features in the bathroom and absolutely proves that opposites do attract. This post is brought to you by Air Wick. All thoughts and images are my own.